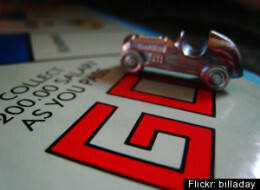 Latest News from Gamecreature: Did Board Games Help Cause the Recession? Did Board Games Help Cause the Recession? I am sure Rohit Chopra's article was written with tongue firmly in cheek. After all, the Game of Life was originally invented in 1860 and while in some areas it has been updated to keep up with the times (the version we're all familiar with made its debut in 1960) it is still a very simplified simulation of one's travel down the "road" of life. Monopoly was invented in 1903 and it was actually created as an object lesson in the dangers of concentrating land in private monopolies. Indeed, as the game progresses, it becomes less and less fun for those who are trying to play catch up. The same could be said for Scrabble. To me, there is nothing more frustrating than sitting across the table from someone who has somehow managed to memorize the entire dictionary. What's more, games can drag on for hours and there are few opportunities to win once another player has captured a commanding lead. That's why my word game of choice is the recently released Nab-it, from Hasbro.